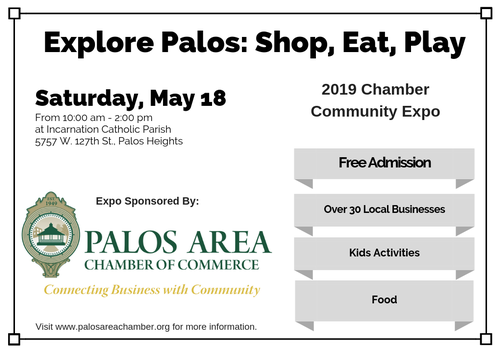 The Palos Area Chamber of Commerce is excited to announce the new and improved annual Expo: Explore Palos: Shop, Eat, Play. Promote your business or service to community members who will be in attendance to learn all about the businesses in the Palos Area. The improved expo will include kids activities, local business exhibitors, food and so much more. Vendor spots are limited. Please confirm availability before submitting application. New this year! Local restaurants/caterers can introduce their business to the community by providing samples to attendees. $275 Exhibit & Membership (New members only. Join the Chamber & exhibit and save $25).